I am sorry the photo is a little dark but I wanted to show the embossing on this card stock and this seemed to be the only way to capture it. 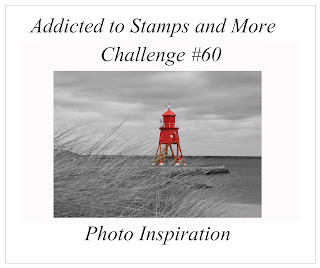 So obviously I was inspired by the lighthouse and did try to make a card using a free digi image of a lighthouse but with not much success. Then I had a light bulb moment (I know, bad pun!) and used these Fresh Squeezed Stamps to make my card. I do love how it came out! What inspires you in this photo? Or perhaps you want to use an image from Nicecrane Designs-we have a freebie on our blog here, where you can also see the wonderful creations our DT have come up with this week. I am looking forward to visiting your blogs, now go and get inky my friends and have fun! Really creative and fun! I especially love the sentiment and how it all relates to a light shining from a lighthouse. The twine looks great too! I LOVE the photo and your version of it! You do CAS so well, Sandie! I love the texture from the embossing...wow! And the touch of masking is awesome Sandie! Gorgeous card. Super cute, love the sentiment with the light bulb! Thanks for playing along with our 'No Flowers' challenge over at ABC Challenges!